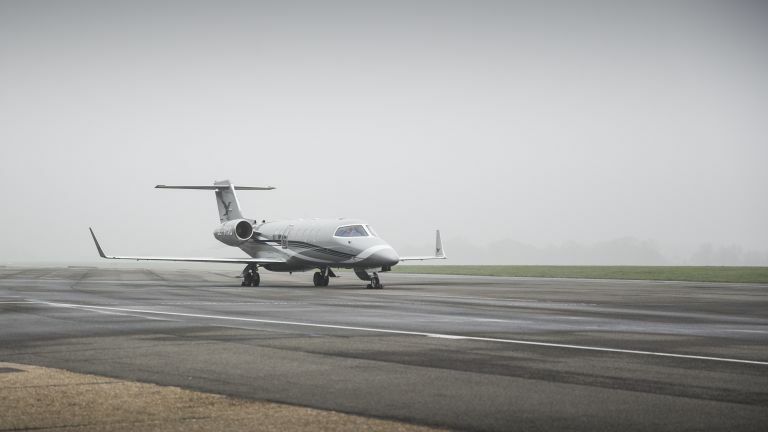 Private jets are no longer the preserve of Hollywood celebrities, rock stars, and billionaire businessman, as I recently found out after flying to the Isle of Islay with Stratajet, a platform which aims to make private jet travel more accessible and affordable. After arriving at a small airport south of London and having breakfast while waiting for the thick fog to clear, I walked out onto the tarmac and boarded the jet. It really was as seamless as that, and avoids all the queues, questions and checks of commercial flying. The pilots greeted me onboard the jet and within 20 minutes we had taken off. The Learjet 45 I charted was well stocked with snacks and a few chilled bottles of Laurent Perrier, with enough seats for me and up to seven friends or family members. Needless to say, it’s a very comfortable experience, partially thanks to the highly pressurised cabin (which doesn’t dry your skin out), and partially to the soft leather seats and luxury furnishings. After just one and a half indulgent hours we’d landed on Islay, ready to experience it’s whiskey, stunning scenery, and amazing links golf course. How much can you expect to pay? Stratajet disrupts the industry by being completely upfront about the costs (no estimates or going through secretive booking agents), but, of course, flying privately is never going to be economy-level cheap. If you’re travelling with seven friends on a similar journey to mine, you’re looking in the region of £10,000 (£1250 per person). That’s expensive, but for this level of comfort and luxury, I think it’s money well spent. By far the most annoying thing about commercial air travel is that you're asked to arrive and hour or two before take off, giving you enough time to get through security, and then what seems like an age waiting in the airport terminal. When flying private you should aim to arrive just 15 minutes before your flight is due to depart. If you're running late, the flight will not take off without you (but you may miss your slot, and that can cause all sorts of problems). Okay, this one is pretty obvious, travelling on a private jet is much more comfortable commercial flights. The boarding process is easier and more pleasant, the seats are plusher, there are a range of snacks available and a bar, depending on your choice of aircraft. As we previously mentioned, the cabin is a higher pressure than commercial planes, so the air doesn't dry your skin out, and the journey isn't as tiring. Booking with Stratajet makes private air travel even easier than booking a flight with BA. Simply search flights by providing your destination, the times you wish you arrive and depart, and the number of passengers. This will display the results page listing a variety of aircraft choices. From here, you will be able to browse and select your desired aircraft for the leg of your journey. You can also arrange transport to and from the airport, as well as any other special requirements. Once you're happy with your choices, you can book the flight and pay via Apple Pay (or more traditional methods). There are no hidden charges, and the price you first see online is the price you pay. Empty legs are flights which are scheduled to fly without passengers, usually back to their home base or to their next destination in preparation for their next charter flight. Empty flights are inefficient for aircraft operators to carry out, as they do not make a profit from these journeys, and they're not environmentally friendly. Finding an empty leg for your journey is a cost-effective way to hire a private jet, as charter operators usually sell these flights at up to 75% off the original charter price. Stratajet uses software to optimise existing empty legs by diverting the aircraft to your destination, whilst being en route to the final location the aircraft was flying to anyway. And finally, when travelling by private jet, you can usually take your pet cat, dog or hamster with you in the cabin (providing that all pet travel documentation is correct and up-to-date). Pet travel on commercial flights can often be very difficult to organise, with pets usually having to travel in the hold (which can be very stressful for the animal). Travelling with your pets via private jet is a comfortable and stress-free alternative.